Free Admission and Light Refreshments will be served. Bring a friend. In July/August 2012, a team of maritime archaeologists, wreck divers, and inquisitive volunteers from Florida, Hawaii and The Bahamas explored the remains of a 19th century slave schooner off of the ragged shoreline of Lynard Cay, Abaco. Among the artifacts recovered were numerous ballast stones found scattered in gullies of Lynard Cay and nearby Goole Cay, bricks, copper sheeting and amalgamations of nails, spikes and other metals concretized into the surrounding rocks and reefs. A 129-ton, 88-foot schooner, the Peter Mowell was illegally transporting 400 Africans from the Congo River to Havana Cuba when it wrecked on July 25, 1860. The captives included men between 20 and 36 years, women between 20 and 30 years, and 256 children between 6 and 20 years. With gratitude to the treacherous shoals of Lynard Cay, its 390 survivors were not sold as slaves like the estimated 12-million Africans forced into submission throughout the three-century transatlantic slave trade. Instead, they were rescued by wreckers from nearby Cherokee Sound and transported to New Providence. They joined some of the last 37,000 African-born immigrants who had been rescued in The Bahamas after the British slave trade had been abolished. A handful of men were immediately transferred into the British West India army regiment but the majority were integrated into the local New Providence communities. Although genealogical research into these survivors has yet to be done, it is unquestionable that their descendants form the backbone of many modern-day Bahamian families. Though the artifact collection was not great in number, I am grateful that I was able to be a part of the research team and work together with professionals on the recovery of the Peter Mowell. It was an eye-opening experience into the field of nautical archaeology and the processes of historical and archaeological investigation. In addition to deepening the knowledge of our own Bahamian past, this project serves to demystify the fields of anthropology and archaeology for a lot of Bahamians. Maybe now, more Bahamians will know what anthropology and archaeology are and where and how they can be done in The Bahamas. Kelly’s tertiary education began at the College of The Bahamas were she studied History for two years. During her time at C.O.B., Kelly participated in a Spanish immersion course in Cuernavaca, Mexico, sponsored by Santander Bank. It was this experience that fed her desire for fluency in the Spanish language and sparked her interest in prehistoric civilizations and cultural studies, which would later change her course of study and professional pursuits. In 2009, Kelly transferred to the State University of New York at Plattsburgh. In 2010, Kelly found her way back to Mexico as an intern with an international non-governmental organization, Proworld. She worked in the area of community development in the establishment of community museums throughout Oaxaca, Mexico. 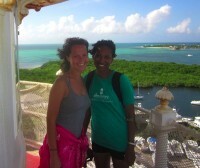 During her two and a half months in southern Mexico she also taught English and served as media intern for Proworld. Having spent a semester abroad at the University of East Anglia where she studied Anthropology, Archaeology and Art History, she graduated in December 2011 with a Bachelors of Arts with Honors in Anthropology. She minored in Archaeology and Spanish. Her senior thesis was entitled: Contextualizing Migration in Oaxaca, Mexico. Since returning to Nassau in December 2011, Kelly has worked as a private researcher for various individuals and with the College of The Bahamas as a volunteer in oral history collection. Kelly is currently working as a Trainee Archaeologist at the Antiquities, Monuments and Museums Corporation (AMMC) where she is involved in cultural resource management activities as well as genealogical tracing for the Peter Mowell project, under Archaeologist, Michael Pateman. Her interests lie in both socio-cultural anthropology and archaeology. She plans to continue her studies in Anthropology. In her spare time, Kelly enjoys speaking with and interviewing older people, our walking libraries, in the community, as history has always been a love of hers. She assists with the leadership of the Faithful Girls in Christ Club at East Street Gospel Chapel and is a member of the National Youth Orchestra, where she plays the clarinet and the saxophone. Watch Womanish Ways, Freedom, Human Rights & Democracy at the Bahamas International Film Festival! It’s been 50 years since women in The Bahamas exercised their right to vote in the 1962 general election and many events have been planned to commemorate the historical event and to use it to examine how far gender equality has come. The newly-released 2012 Bahamas phone books put women heroes in the spotlight, while this week will see The College of The Bahamas host a Women’s Suffrage Movement Symposium. Yet for 10 years Bahamian writer Marion Bethel has been seeing her vision come together in a documentary that honors these Bahamian suffragettes and their legacy. The teasers for the project will be shown during the symposium at the college, yet the final production to be shared at the end of the year will no doubt pay a long-overdue tribute to often forgotten local heroes for whom we have to thank today for our privileges. For Bethel, it’s been a long journey of discovering her natural storytelling ability to making this documentary, including the publication of two acclaimed collections of poetry: “Guanahani, My Love”, the recipient of the prestigious Casa de las Americas Prize, and the more recent “Bougainvillea Ringplay”, both which – in the same spirit as the documentary – examine the politics of Caribbean identity. Yet this lawyer by profession discovered writing as a form of political activism later on in life. Throughout her childhood growing up on Nassau Street, books always surrounded Bethel, whether at home or on Saturday visits to the Southern Public Library or on Sunday visits to church. Such an upbringing fostered in her a love of language. 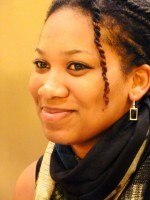 That love of language drove her to study modern languages (French, German and Spanish) at McGill University in Canada, yet it wasn’t until she was studying for a Masters in Education at Columbia University that she immersed herself in the local poetry scene and discovered the work of significant female African-American writers like Toni Morrison and Alice Walker. Indeed Bethel always involved herself in political activism, especially for women’s rights, that keen sense for justice perhaps something which drove her to then begin studying law at Cambridge University. Yet in writing she found the perfect way to express such political motivations and desires. From then, Bethel found a calling in writing, and though she studied law at Cambridge, it wasn’t until she was able to meet her literary hero face-to-face that she gained the courage to focus fully on her writing. A week before Bethel’s bar exam in 1984, Alice Walker arrived to hold a reading in London. 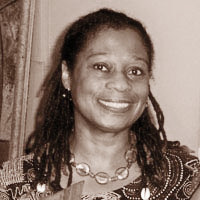 Bethel went on to sit and successfully pass her law exams in September of that year, shelving her poems as she began her law practice at home in The Bahamas and gaining satisfaction in traditional modes of activism, founding the feminist group Developing Alternatives for Women Now (DAWN) and immersing herself in the anti-death penalty movement in the early 1990s. Yet with encouragement from her writing group, the Bahamas Writer’s Association, and upon a push by her literary mentors Kamau Braithwaite and George Lamming at a 1992 Caribbean Writers Summer Institute at the University of Miami, she submitted her shelved poems from that defiant summer of writing and published the now widely acclaimed “Guanahani, My Love”. Soon thereafter, on a fellowship at The Bunting Institute at Harvard, she began her second collection of work which would become “Bougainvillea Ringplay.” Yet in early 2000 she began to feel a shift in her work to more outwardly political, feeling a desire to write about the Bahamian Women Suffragettes she grew up with, a desire that soon transformed into the decision to begin a documentary, inspired by the films she saw Bahamian filmmakers like Maria Govan and Kareem Mortimer creating. July 16, 2013 – After screening more than 50 films in 3 days (including 15 world premiere films) during the 5th Annual International Festival in Philadelphia, PA, from June 28-30, 2013, George Clifford Blackmon, Co-Founder & CEO of Urban Suburban Film Festival, caps the USFF screening season by announcing its 2013 Award Winners. Womanish Ways, Freedom, Human Rights & Democracy is a documentary that is dedicated to the heroic struggle of Kate Moss and Mary Prince, two enslaved women who fought for their freedom in the 1820s in The Bahamas, and to the women of the Women’s Suffrage Movement, who continued with the advocacy for freedom and social justice. 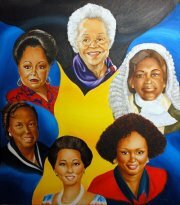 In their singular womanish ways, these women advanced and expanded the cause of democracy in The Bahamas. Olive and her little sister Ava have fallen victim to child abuse while living with their abusive, alcoholic mother. Although both girls protect their mother out of fear of her violent outbursts, Olive always protects and puts her sister first. The film takes an intense and dramatic look at how abuse and alcoholism can impact a family. This family is proof that not everything is thicker than water. Chris attempts to propose to his longtime girlfriend Sharon when he’s confronted with an ultimatum in the form of a test of his love. Sharon challenges Chris’s inability to control his temper by putting him through an experiment that tests the hypothesis of whether a man can overcome his weaknesses in order to receive a long lasting love. The USFF team acknowledges our 2013 Jury of Judges led by Co-founder and Chief Executive Officer George Clifford Blackmon and Co-Founder, and our senior creative directors. Under their direction, the jury screened, reviewed, and selected the 2013 award winners from hundreds of films submitted for inclusion in this year’s festival. Additional information regarding the ongoing mission of USFF and our year-round programming is available on our main website at www.urbansuburbanfilmfestival.com. Interested members of the media are encouraged to contact George Blackmon for additional needs including interviews & supporting high-resolution images. Major sponsors of the 2013 Urban Suburban Film Festival include: Bahamas Film & TV Commission, Crowne Plaza Hotel – Philadelphia West, Employee Benefits Consulting Services, Eatible Delights, and Urban Suburban Magazine. though fame will sometimes come. from bias, ignorance, inequity and death. exchanged for heaven’s everlasting days. Marine skies stained with perennial shame. From the micro-climate of my repentance. If I had known what I know now. If you were asked to name five people who were central to our move to independence, would it include any women? Though they too marched with men during the Burma Road Riots and helped move the country towards Independence, the important story of the women’s suffrage movement has been subdued. Now one Bahamian writer, Marion Bethel, is bringing back to life a major documentary she began almost a decade ago with the working title “The Women’s Suffrage Movement in The Bahamas”, that brings the stories of those major figures in the women’s suffrage movement to the forefront—fitting especially during National Women’s Week this week. The decision also holds a personal note for Bethel. Having grown up on the top of the hill on Nassau Street, Bethel was connected to the very people in her documentary through her childhood community. On her way to Western Junior School, she would pass the homes of women suffragists like Mildred Donaldson and Althea Mortimer, and nearby sat Bethel Baptist church and St. John the Baptist Church, which were central meeting places for the movement. As a young child, little did she know she was square in the middle of major history in the making. “All the people who helped to shape The Bahamas lived in my community. I was just a child then but what I know now is I breathed in what these women breathed out,” she says. The documentary examines this narrative in three ways:!By focusing on the five women who were central to the women’s suffrage movement (Dame Dr. Doris Johnson, Mary Ingraham, Georgiana Symonette, Eugenia Lockhart, and Mabel Walker); by giving voice to the women who stood shoulder to shoulder with these leaders (such as Dr. Willamae Saunders, Ethel Kemp, Gladys Bailey, Mildred Moxey, Madge Brown, Mother Mildred Donaldson and Althea Mortimer); and by including interviews with those women who voted for the first time on November 26, 1962. The sixty hours of footage thus far includes interviews with family members and close friends of the major figures in the women’s suffrage movement, as well as perspectives by both male and female politicians, religious and social figures. Now that the story that is so often silenced has a platform upon which to speak out loud, Bethel wants to ensure as many voices are heard as possible and that it speaks to its diverse audience. The project initially began in 2001 when Bethel brought Maria Govan and Erica Robinson on to help. They conducted 40 hours of interviews and then, admits Bethel, life got in the way, scattering the team. The project remained dormant for almost a decade when, a year ago, Bethel realized that in 2012 it will be the 50th anniversary of votes first cast by women in The Bahamas. Not wanting to let such a momentous occasion pass her by, Bethel reconnected with Maria Govan – who over the decade had made her award-winning film “Rain”, and brought another award-winning director and filmmaker, Kareem Mortimer (“Children of God”) on board. With such a stellar team, Bethel is confident that the film will be finished in time to mark 50 years of the right of women to vote. However Bethel points out that though they are aiming for the film to be complete by the middle of next year, she does not want it to be screened during election time, allowing the film to exist as a beautiful and important narrative in Bahamian history, free of partisanship. Indeed, she hopes the film fills a hole in the Bahamian history taught today to students, as well as to the public, making it both historically and culturally informative – not only to Bahamians, but to the world. “I’d also like it to have an impact on women and how we see ourselves in this Bahamian community – what our possibilities are, what our strengths are, our alliances and what we might want to shape with our agenda for today and tomorrow,” she says. Fresh out of university life, Maria Lee was one of two Bahamian young women asked to be a part of the team. Her decision to accept was an easy one. She has devoted much of her studies to learning more about the histories of her nation’s people and how they connect to their present-day lives. She is also passionate about the need for cultural awareness, education and celebration of cultural diversity in local communities. Her paternal great-grandfather was among the small group of Chinese emigrants to Nassau in the 1920s. He met and married a woman from Grays, Long Island, and out of their union grew one of the oldest Chinese-Bahamian families in existence today. Maria attributes her earliest curiosities in historical and cultural analysis to her desire to unravel her own family’s heritage. 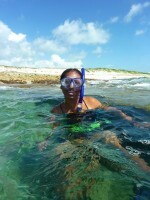 In less than twelve hours after receiving the invitation, she was on her way to Lynard Cay. At the University of Richmond, Maria completed a Bachelor of Arts degree with honours in Anthropology and History in May 2012. She developed an interdisciplinary honors thesis that investigated the symbolic power of slavery in Nassau-based political rhetoric of the late 20thcentury; and explored its implications on today’s popular imagination of a “black”-centered Bahamian national identity. She also became proficient in Spanish through study abroad and volunteer experiences in Costa Rica, Spain, Argentina, and the Dominican Republic. Throughout her travels and research experience, Maria became specialized in the politics of cultural representation, post-emancipation race relations, postcolonial nation building in Latin America and the Caribbean. Working on the site of the 1860 Peter Mowell slave ship, then, was closely related to historical topics that she had been studying throughout her undergraduate career. In quiet moments when we were floating near the site of the Peter Mowell wreck, I would imagine myself as one of the passengers who experienced this traumatic and life-changing event. Looking out at the ragged shoreline, I pictured their footsteps walking on Bahamian ground for the first time. Their stories are unknown. We were only there to piece together physical fragments of the ship that carried them. Yet, in a surreal way, I felt that our trip was the first step in giving tribute to this courageous group of African survivors. Powerfully so, their stories eventually intersect with those of the Bahamian people. They made their homes on our islands, and left imprints in bloodlines that still exist today. My greatest hope coming out of this experience is that more people will want to learn more about their family’s histories, and that sparking these curiosities will lead to greater knowledge of the legacy of these survivors. Perhaps stories of some individuals will lead to their descendants becoming founding members of the Women’s Suffrage Movement. Even if we never know, we can commemorate their bravery, ingenuity, and perseverance in similar fashion. 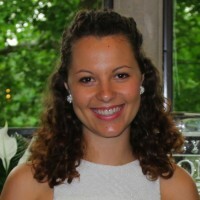 Since graduating, Maria has decided to pursue a career in cultural resource management, with plans of graduate study in Museum Studies in Fall 2013. She is especially interested in developing the cultural infrastructure of The Bahamas, and promoting rigorous academic research across many disciplines. Starting in January, Maria will be working at Islandz, a budding cultural company that provides historic walking tours of downtown Nassau. 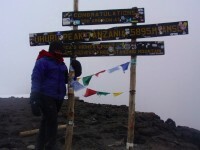 In the summer of 2011, after graduating from the University of Richmond, Gabrielle Misiewicz climbed Mt. Kilimanjaro in Tanzania. She did this as a volunteer for Childreach International, a nonprofit organisation that works to improve healthcare, education and protective rights for children. Gabrielle heard about Childreach and the Kilimanjaro climb through an email forwarded to her by a friend. Since she had no plans post-graduation, she decided there was nothing stopping her from accepting the challenge! 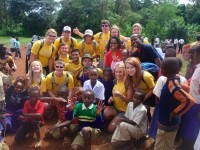 As a Childreach volunteer, she had to raise at minimum $3,900.00 in order to participate in the trip. Half of this would be donated to Childreach’s two partner schools in the Kilimanjaro region, Tanzania, (which she would visit as part of her trip) and the other half would be used towards some of her climbing expenses. Gabrielle signed up for the event in November 2010. She began fundraising in December and surpassed her goal by April 2011 (the deadline). She raised money by writing letters to friends and family and having a bake sale and a raffle on her university campus. To get physically prepared for the climb, Gabrielle did cardio workouts three times a week and lifted weights twice a week. Three weeks before she was to leave, she went to visit a friend in Pittsburgh and there began what she called the Ultimate Two-Week Kili Prep. She went on hikes through the hills of Pittsburgh wearing hiking boots and a weighted backpack for 3 or 4 hours a day, 5 days a week, and climbed up and down the 36-storey Cathedral of Learning. After seven months of preparation, Gabrielle left Pittsburgh and went to London to meet up with her (previously unknown) team members and begin the journey to the peak of Mt. Kilimanjaro. Also known as the Roof of Africa, Kilimanjaro is 19,342ft, and the tallest freestanding mountain in the world. The trek took 6 days, 5 to the summit and 1 coming back down. 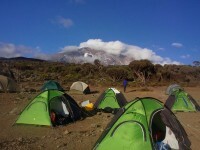 See here an excerpt from Gabrielle’s travel diary: Kilimanjaro Day #2 (48 KB PDF). After climbing Mt. Kilimanjaro, Gabrielle spent some time with friends in London and then returned home. Soon after she got involved in the making of Womanish Ways, Freedom, Human Rights & Democracy, and has been involved in all things related to uncovering the history of the Bahamian women’s suffrage movement ever since. While she is thoroughly enjoying her current work, Gabrielle hopes to enter graduate school in the fall of 2013 and pursue a Master’s degree in ethnomusicology. She is interested in folk and traditional musics and questions of individual and national identity formation, especially where the Caribbean is concerned. Gabrielle also plays classical piano, Japanese taiko, West African drums and other miscellaneous percussion instruments. The road to gender equality is long and requires an entire dismantling of social and legal constructs, particularly in The Bahamas. Many can see that grave issues of gender inequality exist in The Bahamas – yet little can be done unless we begin to come together to hold conversations that identify the problems in order to move towards solutions. That is exactly what The College of The Bahamas is aiming to do next week with the Women’s Suffrage Movement Symposium. Under the theme “Commemorating the past, reflecting on the present, envisioning the future: 1962 and beyond”, the four-day gathering brings together local and regional academics and scholars to take a long hard look at how far women’s rights have come in the 50 years since they first exercised their right to vote. “Initially what we were thinking about is this notion that while women received this right to vote in 1961 and eventually exercised it in ‘62, there’s a sense that the movement has either been aborted or deferred,” said Dr. Christopher Curry, chair of the Women’s Suffrage Committee and head of the History, Religion and Philosophy Department in the School of Social Sciences at the college. “Receiving the right to vote and citizenship did not immediately equal gender equality in The Bahamas, so there’s a long struggle still continuing today for gender equality that giving women the right to vote didn’t actually achieve,” he continues. Indeed women continue to suffer inequalities in every facet of society – socially, politically, and legally especially. While the global focus on women’s reproductive rights have produced heated discourses that stem from fear of giving women power, in The Bahamas even the most basic rights of independently owning land and transferring citizenship onto your spouse and children and the right to legally protect oneself from sexual and physical abuse in a married relationship continue to favor men – to the great detriment of society. After all, Curry points out, when such inequality is perpetuated, the society suffers by depriving half of its citizens with basic human rights. Though the symposium aims to examine the successes and failures of the last 50 years in the first part of the symposium, “The Legacy of the Women’s Suffrage Movement”, the discussion will then begin to take a deeper look at gender inequality as a whole in The Bahamas during the second part of the symposium. A panel of distinguished College of The Bahamas professors and academics will tackle this issue by examining male underperformance in academics, domestic violence and discourses on masculinity. Indeed, taking a look at the very way in which gender is constructed into archaic notions of masculinity and femininity and how both sexes play these acts out to their detriment can shed light on problems the country faces in a world where women are gaining ground and power in fields that are still, through socially constructed notions of gender, considered to be male territory. Such problems stem from the way the sexes are socialized in the home and in schools, points out Women’s Suffrage committee member Dr. Ian Bethel-Bennett, a College of The Bahamas professor in the School of English Studies who will speak on gender discourses during the symposium. “People often talk about male social exclusion and it’s more detailed and nuanced than that – men are opting out of academia for various reasons and they’re also being encouraged to opt out because they’re encouraged to be the providers. So they get a job but they’re not taught that at the end of the day, they’re going to be limited in the future,” he pointed out. The last part of the symposium aims to find ways to push the boundaries of such limited and detrimental constructs through local and international discourse. Bethel-Bennett headed the initiative to bring several regional and international academics contributing to a journal of West Indian Literature to present their papers on gender in West Indian culture and literature, sharing global perspectives through a visit to the college or via Skype discussions on-site. The panels are not the only highlights of the symposium, however – high school competitions in poetry and essay writing on the impact of the Women’s Suffrage Movement are being held and the winning work shared on the first day of the schedule. A teaser for the documentary on the Women’s Suffrage Movement by Marion Bethel will also be shown at regular intervals, as well as even a dramatization that will reenact the famous January 19, 1959 speech that Dame Doris Johnson gave in Maxwell Thompson’s magistrate mourt. Such a comprehensive program really aims to get at the various sources of problems in the present that stem from the past in order to build a future Bahamians wish to see and live in happily and securely. The Women’s Suffrage Movement Symposium will be held March 6 to 9 at the Performing Arts Centre at The College of The Bahamas. For a comprehensive schedule of events, check out The University of The Bahamas website at http://www.ub.edu.bs/ or call 356-0244/5/6 to find out more.